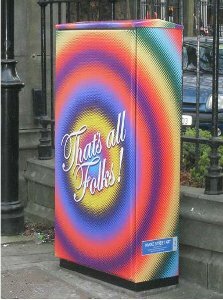 Invoke Street Art is a project that aims to tackle vandalism by covering traffic signal utilty boxes in Dublin with artwork printed on vinyl. The artwork is mostly done by local designers and illustrators. The other day I saw one of these (pictured below) had been vandalized by a graffiti writer who added the word "fags" and I'm inclined to agree with the sentiment though not the use of a homophobic slur (It has since been repaired). There are certain places in a city like utility boxes, the backs of signs, and hoardings around building site where tagging, stickering, and stenciling is relativley unobtrusive and it is reasonable to turn a blind eye to it when it is confined to these kind of locations. The problem of graffiti is not one that is ever going to go away. When you take these kinds of spaces away from the street artists you simply force them to use other spaces like walls, shop fronts etc. Far from providing an outlet for art the project takes away an unofficial outlet for creative expression replacing it with bland, apolitical, officially sanctioned illustration. I would also be concerened that if this project is deemed a success it will simply pave the way for these boxes to be sold onto JC Decaux or some other company as advertising space resulting in yet more space in the city being covered with advertising. Here is a PDF with some info on the project and here is a report from RTE News which features a model perched on the top of one of the traffic signal boxes.